Short and straightforward ride through Switzerland today, mostly along the Rhine from Schafhausen to a farm near Bad Zurzach. 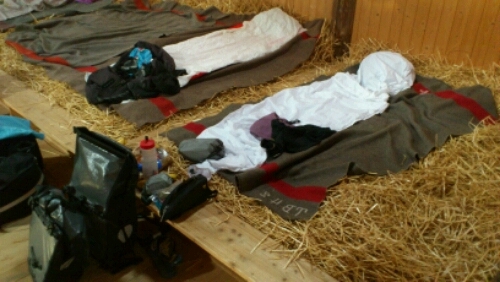 “Schlaf im Stroh” means “sleep in straw”, and I originally thought it was just the name of the B&B/lodging program for Swiss farms, but here with the Schneider family outside Bad Zurzach it really does give you the chance to sleep on straw: clean straw packed into frames in the loft of a converted barn. The ground floor is a very nicely set up group dining room and washrooms, and there is also space on the lawn for tents. It’s still a working farm, too, with a couple types of cows (including a herd of hairy Highland cattle), crops, and a couple of goats. Good weather for most of the day, except for a short but very intense rain squall which we could see coming up the valley toward us in time to retreat to the covered cafe terrace of a local thermal bath/rec centre. We had an afternoon coffee and watched it piss down for about half an hour then stop, which was much nicer than riding through it! Random biking in Switzerland moment from today: rolling through the forest just above the Rhine (which is the Swiss-German border as well) and turn the corner to see a substantial concrete bunker, still in very functional shape, peering over the river toward Germany. We had a chance to briefly meet one of the senior people in SwissMobility, Lucas, who joined us for the day’s ride. Hopefully he got some good feedback from us on what we’ve seen here in Switzerland and earlier on the trip. Off to another lodging farm in Switzerland tomorrow, then finally France on Saturday when we pass through Basel and spend the night in Mulhouse, France.